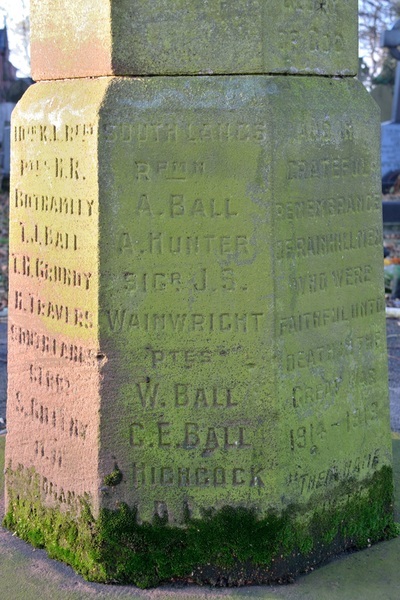 When work by Historic England had been completed, a lot of people asked why all the names on the monument had not been re-cut - "it looks half-finished", 'surely this is false economy" etc etc. A video produced by Historic England, including some Rainhill footage, explains why total re-cutting isn't always appropriate. In conjunction with Historic England and the War Memorials Trust, work has commenced on re-chiselling the names on the war memorial in St. Ann's churchyard. 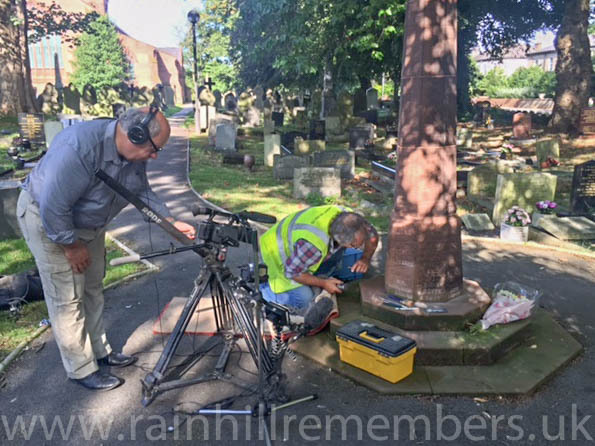 Below is a photograph taken on Wednesday 7th September 2016 showing the work be carried out and recorded for the above. 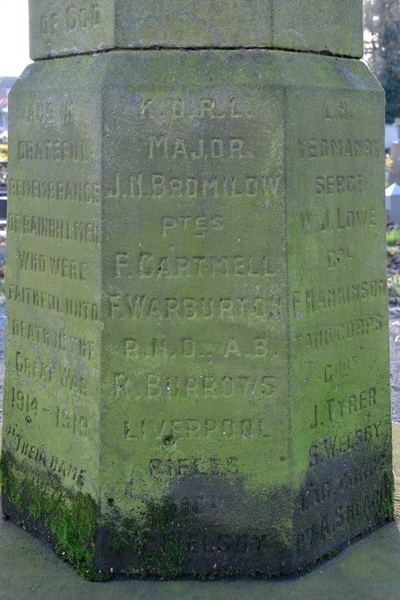 In conjunction with Historic England and the War Memorials Trust, preliminary work has commenced on cleaning the war memorial in St. Ann's churchyard. After cleaning It is understood any illegible text will be re-chiselled. 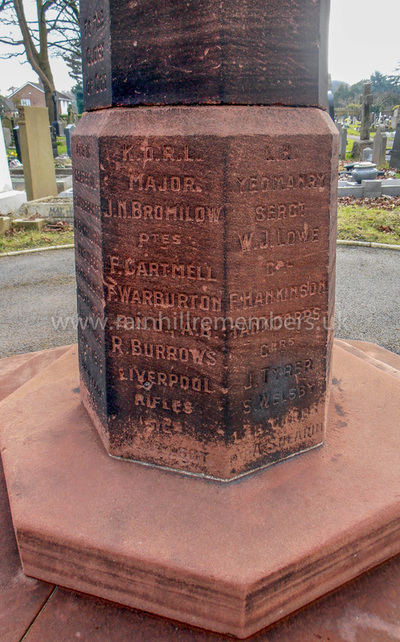 Photographs below show the cleaning process so far (click on image to enlarge). 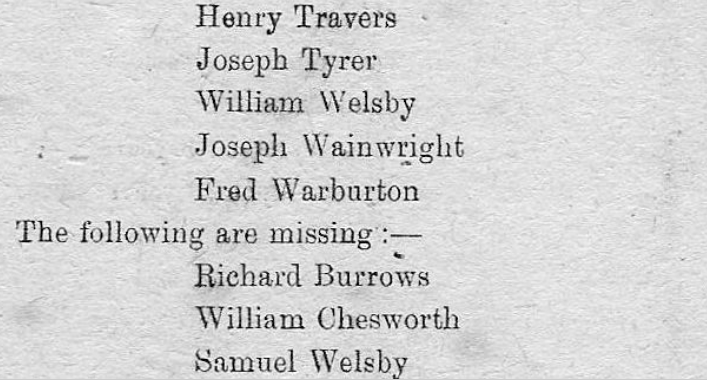 Extracts shown below from Vicar’s (Rev. 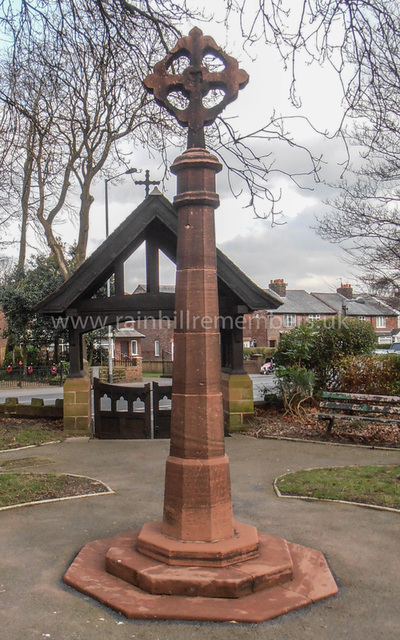 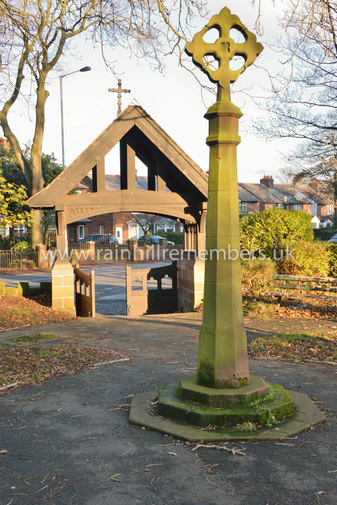 W. G. Swainson) letters in the 1919 Parish Magazines for St Ann’s Church reveal that it was agreed to erect the sandstone monument near the lychgate of St. Ann's churchyard to commemorate the "war services" of men and women connected with the Parish Church of Rainhill. 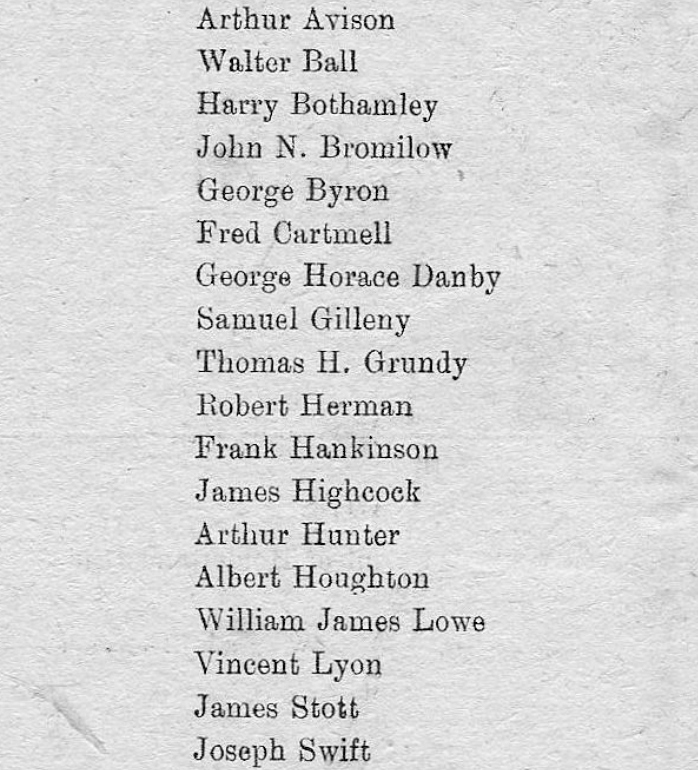 Sept. 1918 A new list of the Names of our men who have served or are serving in His Majesty’s Forces has been placed in the Church. 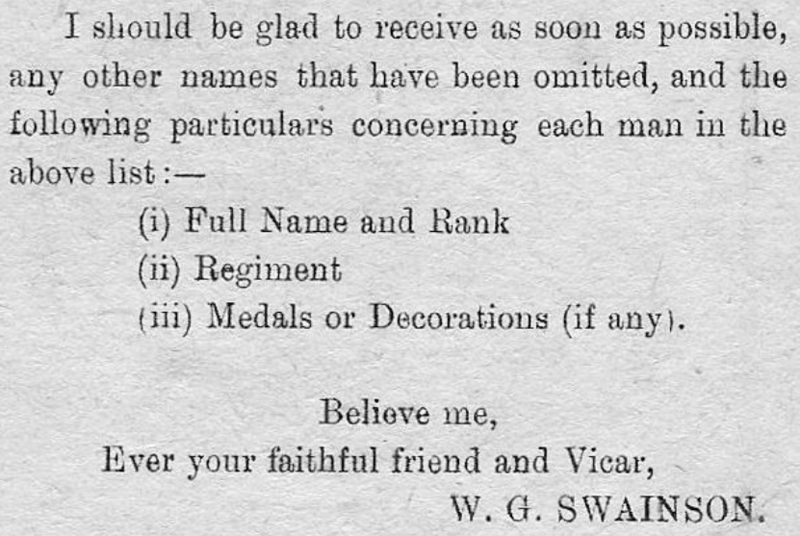 The Vicar will be glad to receive corrections or additions. 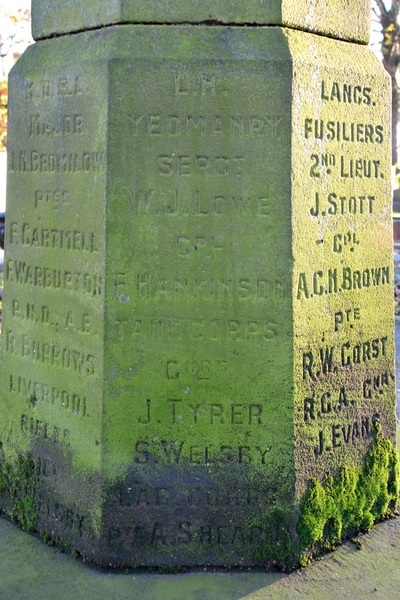 There are at present some 200 names on the List. 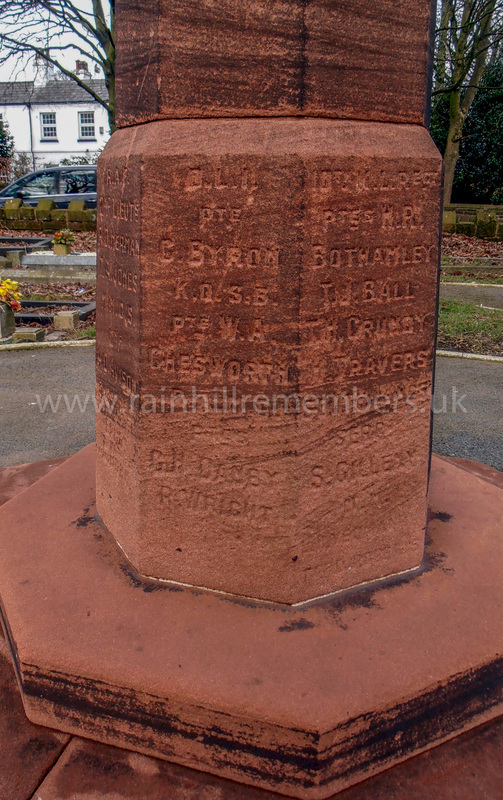 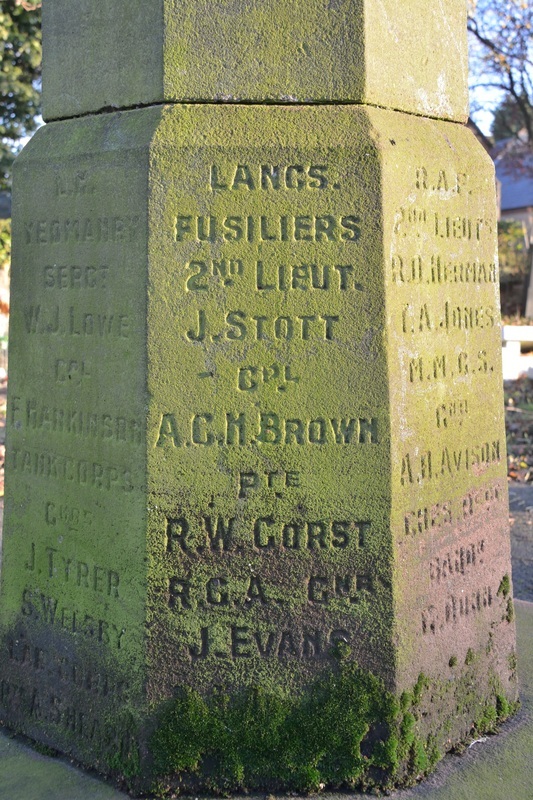 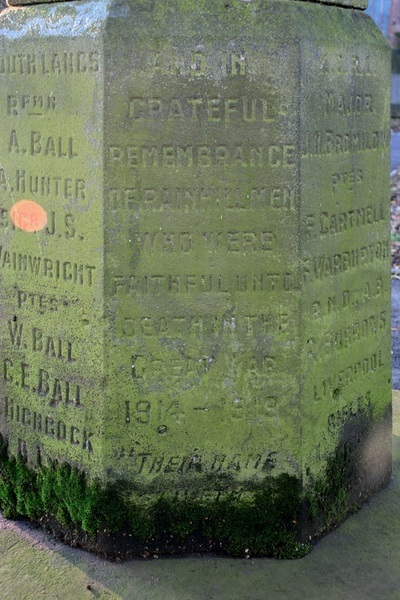 Dec 1918	War Memorial - At a meeting of the Church Officers, which was well attended, held on Nov. 19th 1918, it was unanimously decided to erect a stone monument near the lych gate, to commemorate the War Services of men and women connected with the Parish Church of Rainhill. The names of those who have died in the services will be inscribed on the monument which will be in the form of a cross of local red sandstone. 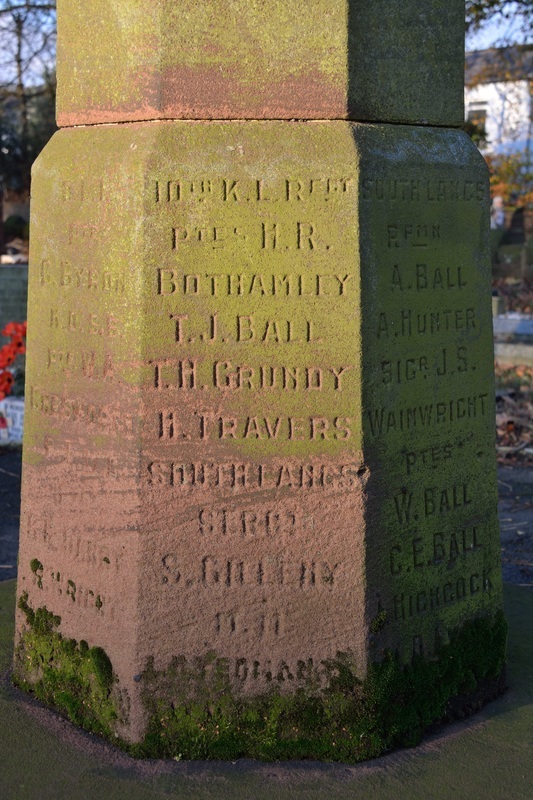 The money which was collected some time ago towards the Churchyard Extension, and, when the Roby family defrayed all the cost of the same, was not required, will be used in setting up this war memorial. 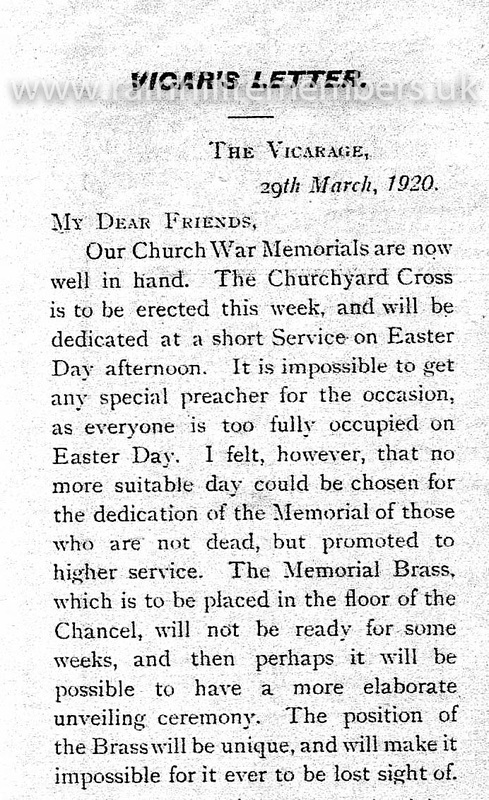 It is proposed to erect this Cross immediately, and later to decide upon some more elaborate Memorial inside the Church to which the congregation will have an opportunity of subscribing. 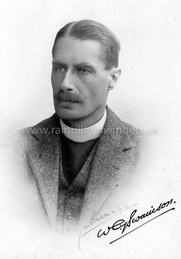 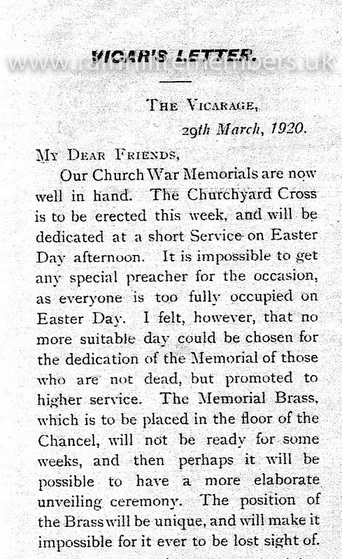 ​This is the Vicar's Letter dated 29th March 1920 giving details of the Dedication ceremony. 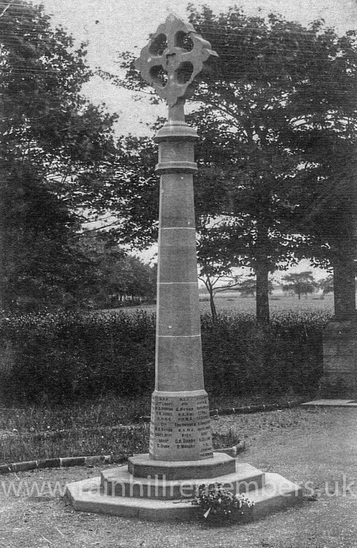 This image shows the monument soon after it was erected in 1920. 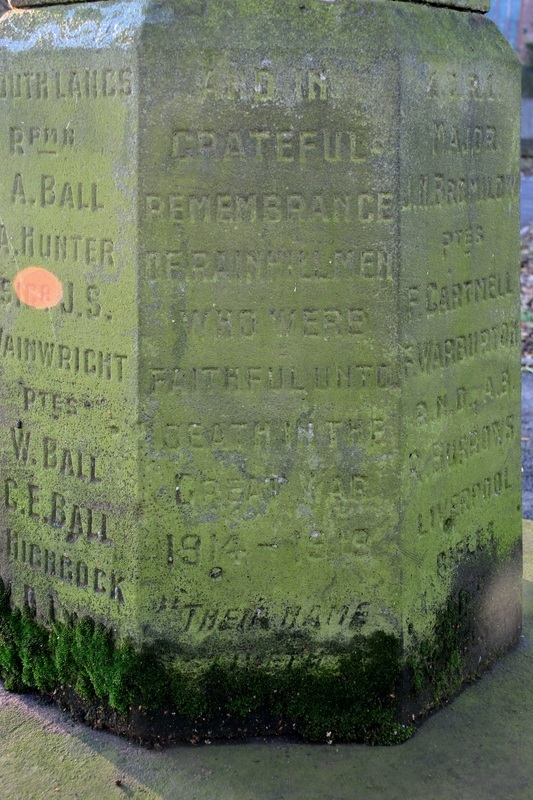 The picture is courtesy of Gerry Chesworh whose uncle William Alfred Chesworth is named on the memorial. 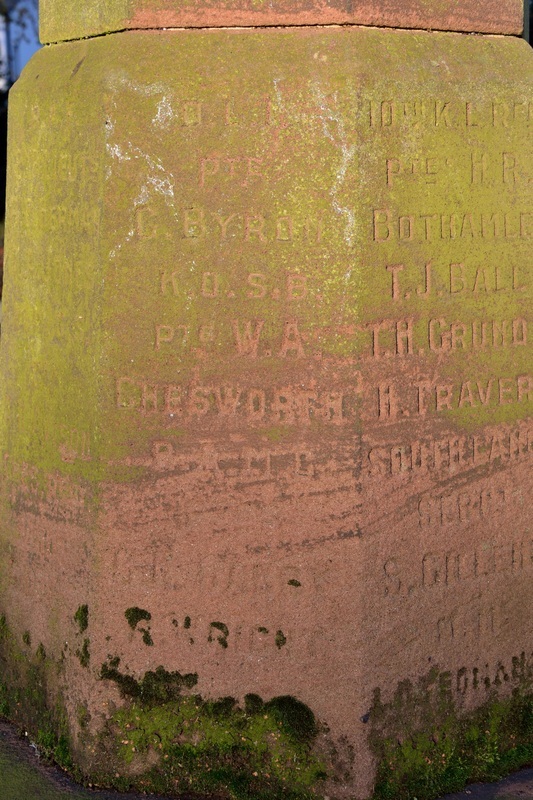 Unfortunately, with the monument being constructed of sandstone, the weather over the last 90+ years has taken its toll and several of the names originally inscribed have either disappeared completely or are very difficult to read. 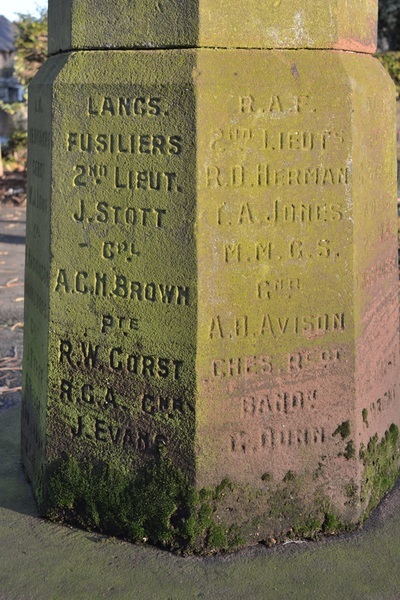 However, the War Memorials Trust is in discussions with St.Ann's Church regarding funding for a conservation project so hopefully all will not be lost. Names of the fallen are inscribed on the eight-sided base of the memorial. 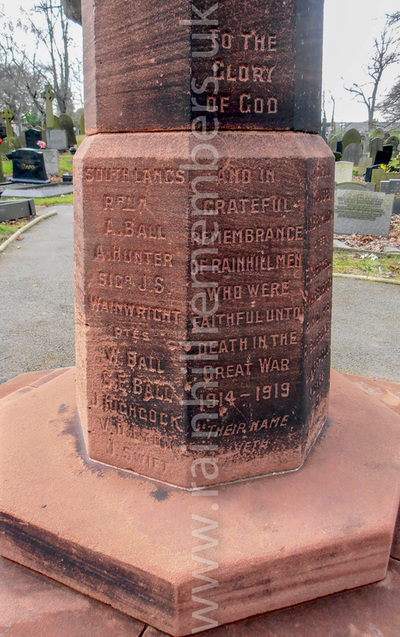 Below are thumbnail images of each side (click to enlarge).